Space shuttle Endeavour is seen atop the Over Land Transporter in a hangar at Los Angeles International Airport. A space shuttle is set to make its first-ever parade through city streets this Friday and Saturday (Oct. 12 and 13), and anyone in the Los Angeles area can get a front-row seat. The retired shuttle Endeavour, which made its last trip to space in May 2011, is soon set to join the ranks of museum displays at the California Science Center (CSC). The orbiter flew to California in September from its previous home base at the Kennedy Space Center in Cape Canaveral, Fla. Since then, it's been waiting at the Los Angeles International Airport (LAX) until the museum is ready to receive it. The final leg of its journey is set for later this week. The space shuttle is due to make the 12-mile (19 kilometer) trip from LAX to the CSC during a two-day parade beginning before dawn on Friday morning. Over the course of its parade through the streets of Inglewood and Los Angeles, Endeavour will stop for celebrations outside The Forum, the former L.A. Lakers arena, and at a street intersection where "Fame" actress Debbie Allen has choreographed a tribute performance. Public viewing will be possible only from select locations, as safety and logistics concerns have forced the police to shut down many streets and sidewalks. This map shows the 12-mile route the space shuttle Endeavour will take from Los Angeles International Airport (lower left) to the California Science Center on Oct. 12-13, 2012. Friday, mid-morning: Endeavour will take Westchester Boulevard to Sepulveda, where it will stop for about nine hours for power lines to be raised. Friday, afternoon: Endeavour will continue down Manchester Boulevard, crossing into Inglewood, where it will stop for another six hours for more power line work. 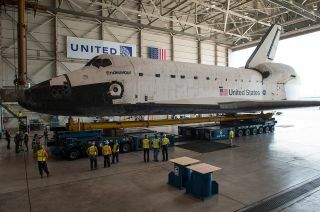 Friday, overnight: Endeavour will cross the 405 freeway. Saturday, 8 a.m. PDT: Endeavour will pass by Inglewood City Hall, where the public can see it, and continue to The Forum for a public ceremony. Saturday, 2 p.m. PDT: Endeavour will stop at Crenshaw Boulevard and Martin Luther King, Jr. Boulevard for the Debbie Allen production, which will also be open to the public. Saturday, afternoon: Endeavour will take King to Bill Robertson Lane and then turn left into Exposition Park. Saturday, 9 p.m. PDT: Endeavour is expected to arrive at the California Science Center, where the public can view it roll in. If you snap a photo of Endeavour during its trip across L.A. streets and want to share them with SPACE.com, send photos, comments and location info to managing editor Tariq Malik at tmalik@space.com. You can follow SPACE.com assistant managing editor Clara Moskowitz on Twitter @ClaraMoskowitz. Follow SPACE.com on Twitter @Spacedotcom. We're also on Facebook & Google+.